Join us for our bi-weekly trip to the best dive site the Gulf of Thailand has to offer. Leaving at 6am to avoid the crowds you will cruise the gulf in our specially constructed dive boat. You can chill out on our relaxation deck while enjoying a light breakfast and discussing your amazing dive with your assigned divemaster. Arrive at Sail Rock and descend beneath the surface to be amazed at the marine life this world class dive site has to offer. You will swim with barracuda, giant grouper, queenfish and the resident school of batfish. You might even be surprised with the appearance of some bigger fish like bull sharks and of course the biggest of them all, the awe inspiring whale shark. If it is the small stuff you are interested in you will not be disappointed as Sail Rock has a wealth of macro which your divemaster will be sure to point out. Get back on deck and share the stories of your dive with your deck mates while enjoying refreshments between dives. You will be desperate to get back in the water for the second dive. Perhaps you want to dive through the Sail Rock chimney? An underwater rock tunnel with an opening at 6m and at 18m it is not for the faint hearted, but an experience not to be forgotten. Did you miss the whale shark on the first dive? This might be your chance. Back on board and it is home time. Another leisurely cruise back to Koh Tao enjoying the calm seas of the Gulf of Thailand. You will be served a delightful lunch after which you may want to sunbathe on our comfortable sun deck. Our Sail Rock Trips leave every Wednesday and Saturday at 6am, returning approximately 3pm. The price includes two dives at Sail Rock; breakfast, lunch and refreshments with new equipment and an experienced divemaster, with a potential third dive available. The trips are for certified divers with deals are available for large groups, please enquire if you are thinking of organising a group trip. Courses may also be taught on board. Contact us or call Bryan on 06 2586 9205. 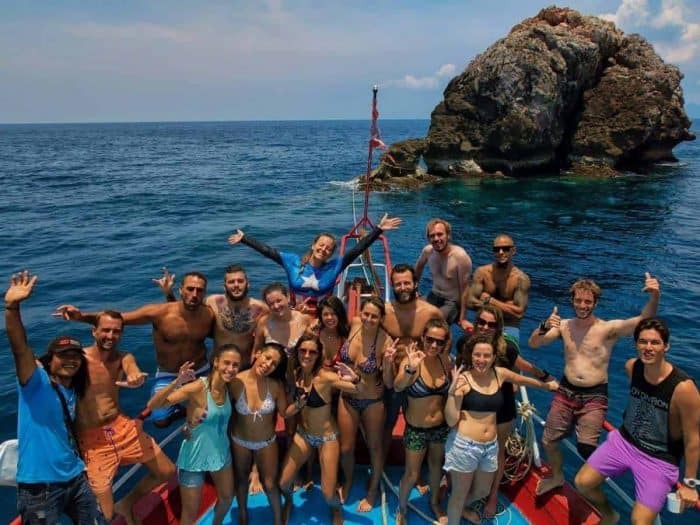 Do not miss the best dive site the Gulf of Thailand has to offer and it is your best chance to see the big stuff and cruise on one of the best dives boat in Koh Tao. The price includes breakfast, lunch and refreshments and 2 dives at Sail Rock. If conditions are suitable we can also offer an optional 3rd dive at Shark Island or another great dive site on our return for an additional 700 THB (payable on the day). Book online today and receive a 5% discount, the total cost will be 2,660 THB. Join Mojo Divers for Koh Tao Scuba diving. Do you want to know more about a Koh Tao Dive course? Mojo Divers is number 1 Diving school in Koh Tao. Feel free to contact us for a diving course.